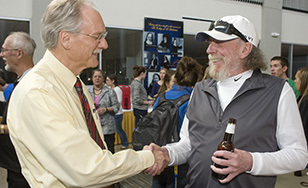 President Larry Goodwin chats with Doc C during a recent celebration of the professor's career. Can you picture St. Scholastica without Doc C? Biology professor Gerald "Doc C" Cizadlo, one of the College's all-time most popular teachers, stepped down from his on-campus teaching role this spring after 39 years. In a fitting next step for the educator who pioneered St. Scholastica's online academic presence, Cizadlo is moving to a virtual existence. He'll still teach, but online classes only. The change will give him freedom to travel, but he'll miss working with his students in person. "I like to see their eyes light up when they've grasped something that they didn't realize they could understand. It's really rewarding," Cizadlo said. His basic teaching philosophy spurred his famous catchphrase: "Can you picture it?" "I think that before you can understand anything, you have to be able to visualize whatever you're trying to understand," Cizadlo said. His former students testify to his effectiveness. "I think what made him stand out was his passion to teach," said Tami Kobienia '94. "It is staggering to imagine the number of lives he has touched by preparing healthcare professionals in their careers. He will be missed deeply." "He spoke in pictures and process," said Candace Peterson-Kolenda, his student in 1978 and again from 2007-2010. "I never had to memorize anything because I could see it from his language of pictures." "It's nice that some of the people feel it's been a meaningful experience in their lives," Cizadlo said. "What more could you ask for?" His impact goes far beyond the thousands of students he's taught at 1200 Kenwood Ave. When he and the IT department started posting podcasts of his lectures, his email inbox was immediately flooded with positive responses. "All of a sudden, people from all over the world were listening to these things," Cizadlo said. "From a lecture hall in Duluth, I could have a big influence on healthcare in the outer reaches of Mongolia. That is really something." While continuing to build upon that legacy in his new virtual role, Cizadlo is excited about his newfound freedom. He'll treasure time with his daughter Anne '95, and he's looking forward to spending time in the house he and his wife built on a South Dakota golf course. His impact in online education will only keep growing. "The influence I can have on people that they can have on others...it really multiplies out," he said.